Once upon a time I posted a recipe for a recipe that I didn’t personally make. These citrus scones appeared on my kitchen table in a magic Welcome Home basket a few days ago, and they are so heavenly, so buttery-moist and just a little crumbly, that I can’t not share. I am not ready to bake my own things yet. Eating baked things that others make for me: y-e-s, yes, yesyesyes. But baking in my own kitchen would require me to think and plan and buy baking stuff, and considering that I just drove a car for the first time in a year and photographed these 2 single remaining scones on paper plates (the only thing from the kitchen not still in a box), I don’t think I’m quite there. But again. The eating. I have an amazing baker in my family and her name is My Sister. Except her real name is Kristin and she’s cute as can be. This is my thank you letter to her and my love letter to her scones. You guys? Even if you don’t love scones, just try these. Because something about the texture of these is so perfect. Look at that first picture again —> hello perfect scone crack. I mean literally, the crack through the middle. Isn’t that some sort of prerequisite for awesome scones? I wouldn’t know because I don’t make awesome scones, but Kristin does, and hers have a scone crack, and I couldn’t love it more. She loosely based the recipe on one from our hometown church cookbook and then added her own zing, zest, pinch of Kristin, like she does. They turned out just buttery enough, so they were almost soft, but still sturdy enough to kind of break pieces off and dunk in coffee. And the glaze dries gorgeously on the top and gives it the most perfectly subtle citrus sweetness. I had mine topped with the two best scone toppings in the history of life: butter and honey. And a big ol’ morning mug of coffee. And then another one, and repeat for one week. If scones aren’t your thing, yoooouuuu still have to try them. But if you want to bake other cute things like Kristin, go back in time to her Fruit Pizza. I posted the recipe on Pinch of Yum even though layering fruit in beautiful designs is not the kind of thing I am really good at. Right now Kristin is singlehandedly keeping this little bloggy alive. I think I owe her some lentils. Hey. Butter and honey. Don’t forget. 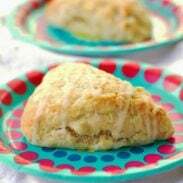 These citrus scones that my sister makes are the best homemade scones I’ve ever had. Perfect with a cup of coffee and drizzled with a light citrus glaze. Preheat the oven to 375 degrees. 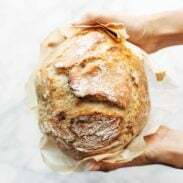 Combine flour, sugar, baking powder, baking soda, and salt in a large mixing bowl. Cut in butter to the flour mixture and then add the zest and buttermilk. Stir until just combined. Drop by spoonfuls onto lightly greased baking sheets, or form dough into a 1-inch thick circle and cut sections like pie pieces. Bake for 12 minutes. Cool completely. Whisk icing ingredients together in a small bowl until smooth. Drizzle icing over cooled scones. I love to bake and would call myself a total baker. But maybe I shouldn’t because I’ve never made scones! Agh. These look gorgeous. They look like they would have the perfect crumble when you bite into them. Thanks for posting! Are there any substitutes for buttermilk? Milk with a teaspoon of vinegar! Mmmmmm! I have all these ingredients right now. Fantastic. Just to be sure though, is almond flavoring the same as almond extract? Thanks for all the wonderful recipes. yes! 🙂 that would work fine. These look great and I hope you guys are getting all settled back in! oh goodness! i’m glad you posted the recipe. they look so buttery and soft! Its great that you have such a loving support system to come home to! And your sister is so pretty! I know! Gorgeous AND scone expert. She’s got it all. Mmm I love scones and citrusy ones are the best! I’ll call my sister, she’ll be right on it. These scones look delicious. I so love citrus flavor! I just downloaded your e-book, and it was great! mmm scones and a cup of coffee for breakfast. Sounds really good. I wish I have lemons and limes right now so I can make these. This shall be my before-the-week-ends goal. I see the resemblance between you and your sister 🙂 Glad to hear you’re safe and getting settled back at home. Totally digging these, and your sister is the cutest! Momma must be proud to have two great cooks!! Cute! and I looove the sound of jam and clotted cream. I love seeing so many scones around now. These look so delicious! Your sister is gorgeous! And very talented it seems. Perhaps you should nudge her into starting a blog to showcase all her delicious baked goods? Now that’s an idea ;). How much baking powder? I’m in the middle of making them! Ah! How did they turn out? I totally missed the baking powder on the ingredient list – it should be 2 1/2 tsp and 1/2 tsp. for the baking soda. Sorry about that. I need to slooow down! You have the sweetest sister! I wish my family members baked for me… But I was the only one born with a baking-addicting-gene, so breakfasts, desserts, and birthdays usually fall on my shoulders. (Not that I mind!) But we’re BIG citrus and scone fans, so the combination of the two just might make it to our table someday soon! Your sweet sister is VERY talented!! I have been going nuts over that fruit pizza since I first saw it (about forever ago). So beautifully decorated! And these scones look incredible. I’m just getting into scones. Never really liked them that much but wow – these look to die for! She knows and loves your blog and someday I am going to make you two meet.